It’s impossible to miss the extraordinarily shaped structure peering over the city like an ironclad superhero at the corner of Broad and Belvidere Streets. As part of Modern Richmond Week, a panel discussion was held this past Tuesday, regarding Virginia Commonwealth University’s (VCU) new Institute for Contemporary Art (ICA) building. Speakers included Edwin Slipek, architectural historian/Style Weekly editor Charles D. Piper of the American Institute of Architects, and principal with BCWH Architects, and ICA director Dr. Lisa Freiman. Why were they all there? So their curious minds could be given clarification on the ICA’s overall context and place in the modern design legacy of Richmond. Attendees were also informed about several ambitious goals of the institute–to showcase the art of our time, be a highly accessible public resource to both VCU and the city of Richmond, and to foster a thriving global connection and presence. The ICA is but one of many fascinating contemporary structures in Richmond. However, local architecture displaying fashionable features date as far back as 1814 with the Gothic-Revival style Monumental Church and, most recently preceding the ICA, the Virginia Museum of Fine Arts. Its therefore no surprise that between the ICA’S $37 million privately funded capital campaign, support for local galleries & collectors, and Richmond’s obvious love of art, this city is thirsting for a new contemporary building to support arts and culture. The ICA’s location reinforces the presence of VCU’s School of the Arts throughout the city, while the architectural design reflects its goal of becoming a central and accessible community resource while also establishing itself as an innovative Richmond landmark. To bring this vision to life, the ICA’s main architect, Steve Holl, turned to the short story, “The Garden of the Forking Paths” by Jorge Luis Borges, for inspiration. Which is why two separate entrances exist—one facing Monroe Park, the other facing the university. Holl hoped to convey the impression of two paths speeding in different directions, representing the future and shared by a common plane–present time (reflecting the concept of modernism itself). This creative gateway is both functional and sustainable; with optimal airflow between the forking paths, geothermal heating & cooling, and an emphasis on lighting quality. 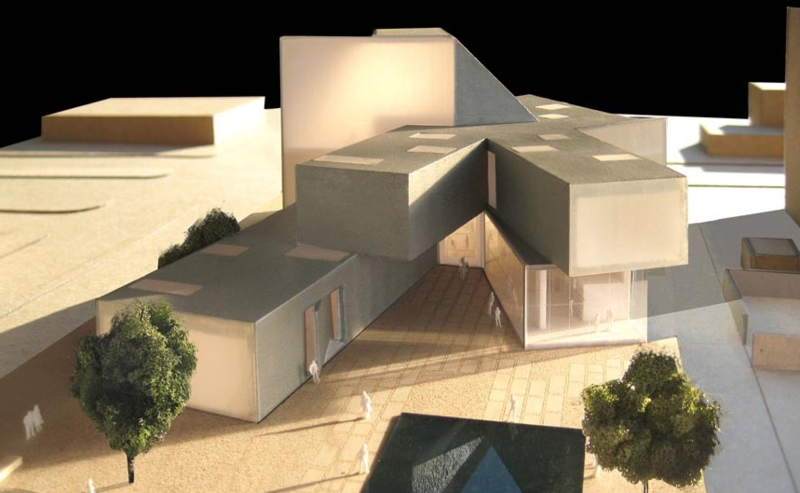 The architectural features include a large entry space, a café, a sculpture terrace, and an auditorium that can hold up to 240 people—ideal for performance art, films, and gallery talks with artists. The space, however, is ultimately designed to let the artwork do the talking. “Declaration,” the boldly entitled opening exhibition, does just that. The exhibition pays homage to current pressing issues—particularly matters regarding free speech. With the public visilbity of this piece and the kinds of engagements the ICA is trying to encourage through it’s exhibits, there is no doubt that Richmond will move deeper into the national conversation. A local and national press release outlining more specific details involving opening exhibitions and events of the ICA will be made public within the next three weeks. If you’ve driven through the Broad and Belvidere intersection at any point in the last year and a few months, you’ve noticed the construction of a hulking glass and steel building that will soon house VCU’s new Institute of Contemporary Art (ICA). In a press conference held today, VCU teamed up with BCWH Architects to offer some insight into the mysterious structure designed by NYC-based Steven Holl Architects. “The site is a gateway to the city, and through the evolution of the Monroe Park campus, its also a gateway between the campus itself and the city of Richmond,” said Charles Piper, Principal at BCWH. His group has been working with Steve Holl locally to help facilitate the creation of the structure. Holl, whose works are recognized internationally for their beauty and ability to transform spaces, started designing the ICA building in 2011. The $41 million (and 41,000 square ft.) structure it is set to open this October, just in time for November’s First Fridays art walk. Piper said the Broad and Belvidere intersection itself helped inspire the ICA’s design – specifically the heavy traffic flow and the area’s many turning movements. All these features helped form the “torsion” of the building, its circular motion, both in the planning and vertically in its section. The ICA hopes to serve many purposes – gallery space, public forum, entertainment and event venue, as well as a meeting space for students and the community. 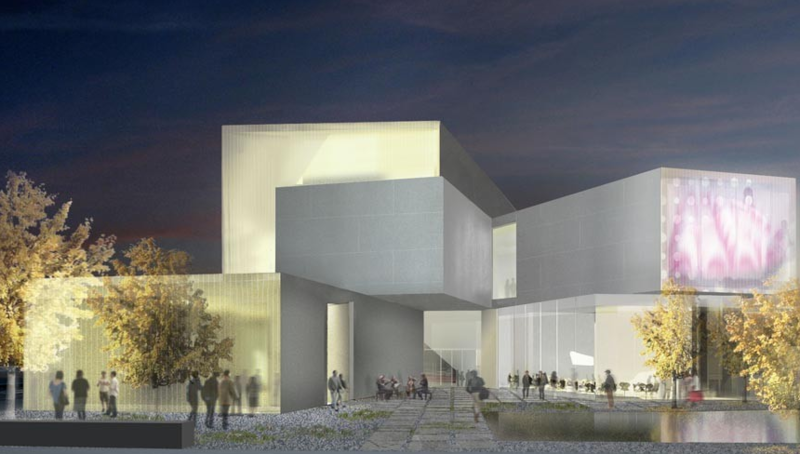 Upon completion, the center of the building will be transparent through from the street to “invite entry and free exploration and connection” according to Piper. Piper also pointed out the obvious: “the building is unlike anything else in Richmond,” but he hopes the intersection’s influence will help the building to “respond contextually” as a gateway to Broad st and Belvedere as an urban entrance. The “double front” of the structure will offer human entry from either the city-side, or the rear where a sculpture garden will guide folks from campus. The building’s dramatic curves and surfaces will also act to alter our impression depending on the time of day, weather and season – from roof top gardens to how light will play off and reflect from its zinc walls. Add to that the asymmetrical nature of the structure and it promises to be a truly unique end cap to RVA’s Broad St. Arts District. “It’s not the same building from any two points of view,” Piper said, specifically referring to the building as a piece of “functional Sculpture” that is animated by its occupants and the items placed in it. As with any modern building, there’s also a stress on sustainability with most of the structure’s guts – steel, glass, concrete and zinc – being made from recyclable materials. Heating a cooling will be handled by 43 geothermal vents that will further reduce the electrical demands while walls will be made of dual layers of insulated glass that act as natural vents for excess heat. “These design elements, as well as the sustainable features, will support the curatorial and educational mission of the ICA,” said Piper in closing – you’re chance to see the structure complete happens October 28th, 2017.